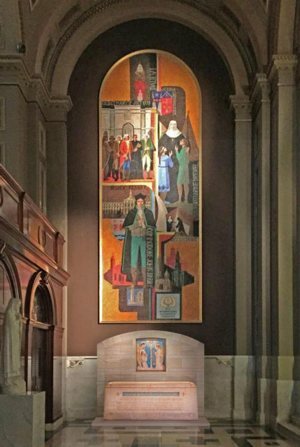 The remains of St. Katharine Drexel, founder of the Sisters of the Blessed Sacrament, will be transferred from the crypt under the chapel of St. Elizabeth Convent, the congregation’s Bensalem motherhouse, in the coming weeks to the Cathedral Basilica of SS. Peter and Paul in Philadelphia. The transfer is precipitated by the decision of the sisters to sell the property because of declining numbers of the order. Mother Katharine was born Catherine Mary Drexel Nov. 26, 1858, the second child of wealthy investment banker Francis Anthony Drexel and Elizabeth Langstroth Drexel. Her mother died almost immediately after her birth, and she and her older sister, Elizabeth (Smith), were raised by their loving stepmother, Emma Bouvier Drexel, along with a younger sister of that marriage, Louise (Morrell). Deeply religious, Katharine founded the Sisters of the Blessed Sacrament in 1891 with the specific ministry of service to the two most persecuted races in American society — the “Indians and Colored People,” the common terms for Native American and African-American people in that era. Mother Katharine died March 3, 1955, at age 97. She was canonized in 2000 with March 3 as her feast day. The new location for St. Katharine’s tomb will be on the left rear of the cathedral, next to the Drexel altar, which was given to the cathedral in the late 19th century by St. Katharine and her sisters to honor Francis Drexel and Emma Bouvier Drexel. It is the only altar in the cathedral that memorializes members of the laity. The tomb itself will look virtually the same as it looked at St. Elizabeth Convent. The focus will be the stone sarcophagus that has contained St. Katharine’s coffin since her entombment. Above it will be the same image from the shrine that depicts three angels in adoration before a monstrance, a symbol of the Eucharist, because of St. Katharine’s great devotion to Christ in the Blessed Sacrament. It is not uncommon for cathedrals and churches to have the remains of saints, Father Gill explained. But very often the founders of religious congregations have their tombs in a chapel of their congregation. For example, the remains of St. John Neumann are at his shrine at St. Peter the Apostle Church in Philadelphia, which since its foundation been conducted by the Redemptorist Fathers. The saint was a member of that order and was the fourth bishop of Philadelphia. He was canonized in 1977. Preparations for the new resting place for St. Katharine were funded by a grant from the Connelly Foundation. “The Connelly Foundation’s support for this project comes from reverence and respect for a true outstanding Philadelphian who gave totally of herself to help others,” said Josephine Mandeville, the chair of the Connelly Foundation, which supports many charitable and educational endeavors in the Philadelphia Archdiocese. In her lifetime, Mother Katharine’s only desire was to be buried in the convent cemetery alongside the pioneer sisters who had preceded her in death. During her years of quiet retirement before her death, the leadership of the congregation decided she should be entombed in a crypt shrine, and this was prepared with the permission of Cardinal Dennis Dougherty. That her remains should now come to the cathedral is appropriate. Although it was not technically their parish, the Drexel family often worshipped there and her father was a generous donor to its construction (1846-1864). For many years, the cathedral was the site of an annual memorial Mass long before her 2000 canonization. While the new tomb for St. Katharine will be available for veneration and prayer by the faithful shortly after it is installed, a formal Mass of dedication will be celebrated Nov. 18 by Philadelphia Archbishop Charles Chaput. Other plans, also possible through the Connelly Foundation grant, include several new programs to promote the life, work and witness of St. Katharine Drexel as well as a new website and online documentary.